Kind, helpful staff. Comfortable bedroom. Great breakfast. Reception very good and helpful. Room clean, bit dated but very comfortable. Nice hotel in the centre, perfect for what we wanted. Excellent value for money. The hotel probably needs updating or refurbishing, but it doesn't matter. It is so central, such an excellent price and the inclusive breakfast was superb and had a wide selection of continental and cooked goodies. Even my poached eggs were perfectly cooked. Staff were all wonderful and both gentlemen on reception on the evening shift and morning shift next day, were charming and helpful. Staff at breakfast worked hard to keep us all fed and watered. Housekeeping on hand at a moments notice to give us extra tea bags. The twin room we had was comfortable, and surprisingly well equipped, it even had an iron and ironing board. 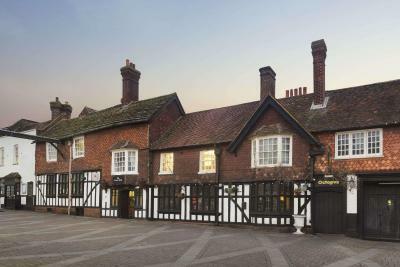 We will be using this hotel for our Gatwick stays in the future. Measured against airport hotels, and taking into account taxi fares each way of £12.50, it comes out at much better value all round. Thank you to all the fantastic staff. Room was quite nice, better than I expected from the outside. 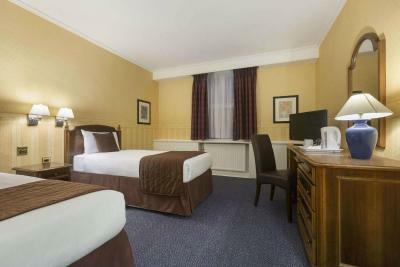 Location as in distance to Gatwick airport and evning entertainment. and car parking availability. The bathroom was very clean and new. The bedroom also seemed very clean. 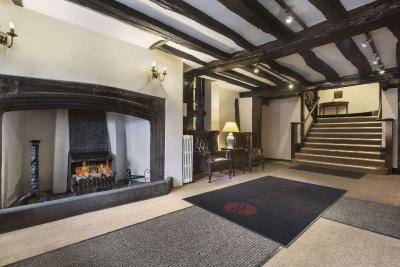 The room was big for the amount we paid and I was very happy with the value for money. When we checked in we were greeted properly and the guy behind the reception was very nice and told us all the information we needed. Great hotel and staff excellent. Only complaint was that the room was uncomfortably hot and very noisy when window open. 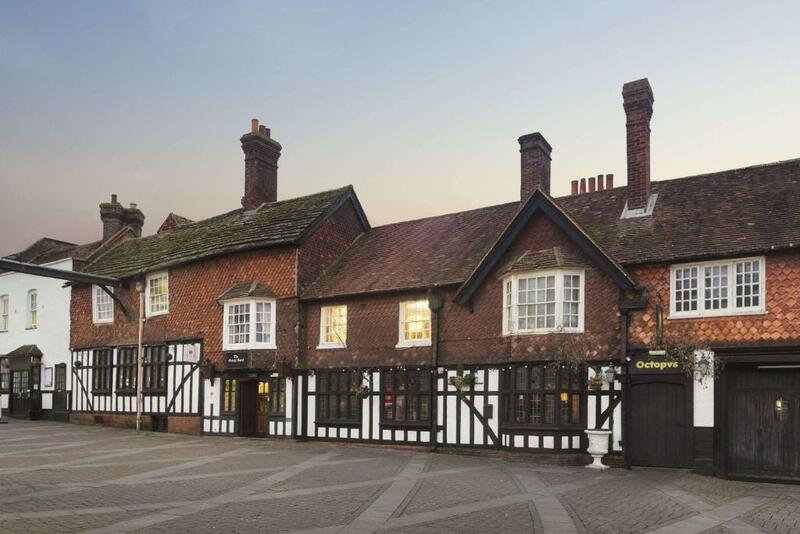 Dating back to 1615, this former coaching inn is steeped in history and character. 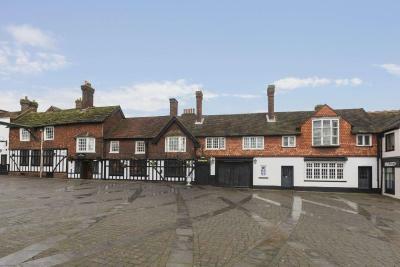 It offers a guaranteed free parking space and is just 10 minutes' drive from Gatwick Airport. 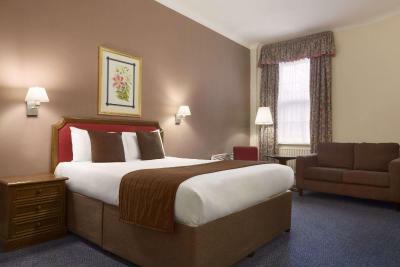 All rooms feature high-speed WiFi, flat-screen TV with cable channels and an en-suite bathroom. An iron/ironing board and hairdryer is also provided. Start the day with a continental, or full English breakfast, served each morning. There is The Wildwood Restaurant, which serves Italian and Mediterranean cuisine, and is open for lunch and dinner. The hotel also has a cocktail bar. 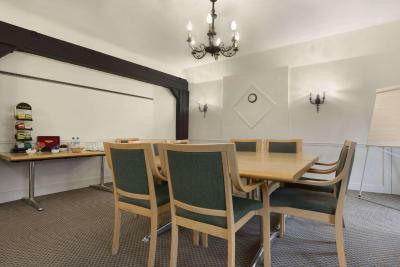 The Ramada Crawley-Gatwick has a wide range of function rooms for meetings, conferences, weddings and private parties. 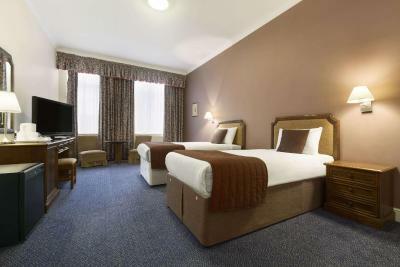 Close to the M23, Ramada Crawley-Gatwick is just 5 miles away from Gatwick Airport, and right in Crawley town centre. 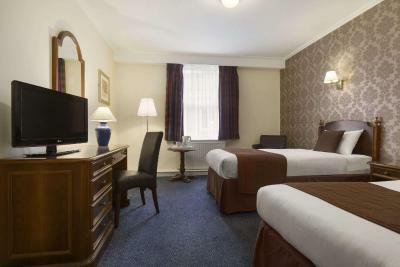 Nightclubs, pubs, restaurants, a cinema and major shopping areas are within walking distance. The local railway station is 5 minutes' walk away. 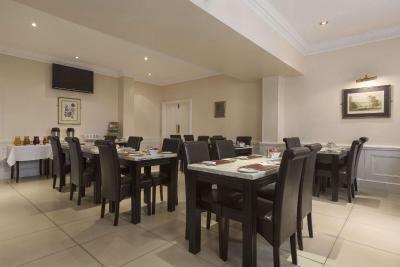 Ramada Crawley-Gatwick has been welcoming Booking.com guests since 1 Aug 2005. 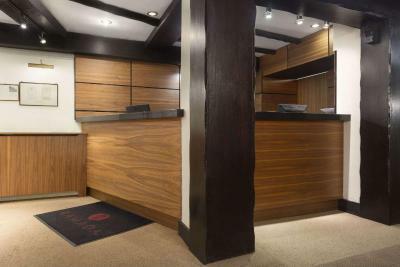 When would you like to stay at Ramada Crawley-Gatwick? 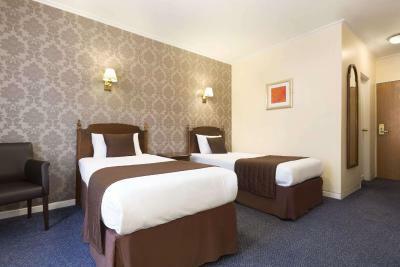 This en-suite room features a double bed and 2 single beds to accommodate up to 4 guests. 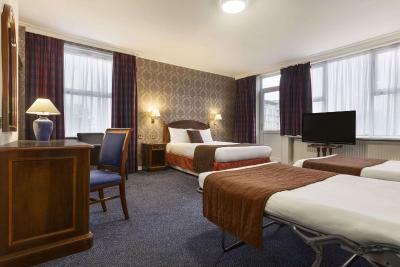 Facilities include a flat-screen TV with cable channels, desk, ironing facilities and a hairdryer. 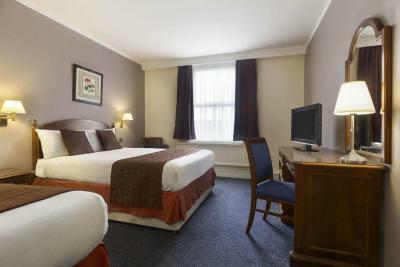 This en-suite room features a double bed, accommodating up to 2 guests. 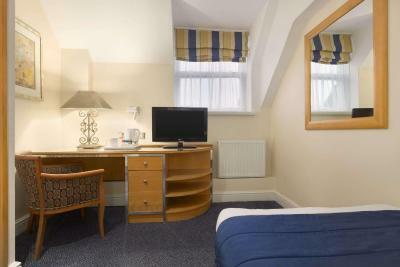 Facilities include a flat-screen TV with cable channels, desk, ironing facilities and a hairdryer. 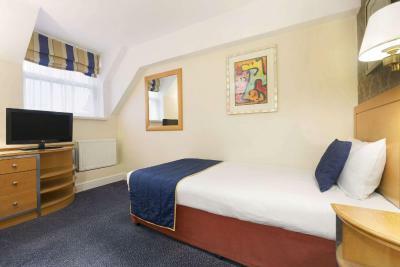 This en-suite room features a single bed accommodating max 1 guest. 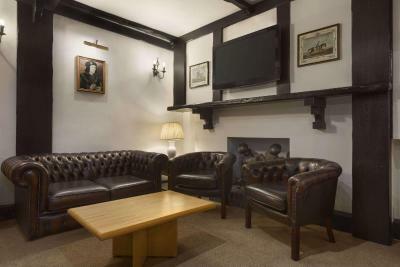 Facilities include a flat-screen TV with cable channels, desk, ironing facilities and a hairdryer. 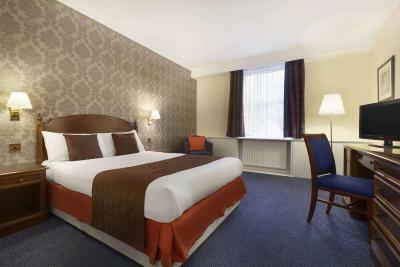 This en-suite room features a double bed and 1 single bed to accommodate up to 3 guests. 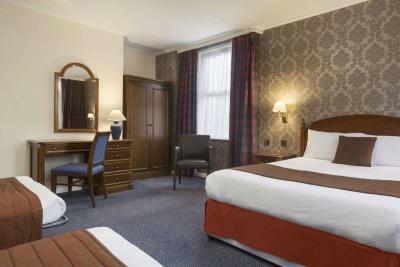 Facilities include a flat-screen TV with cable channels, desk, ironing facilities and a hairdryer. 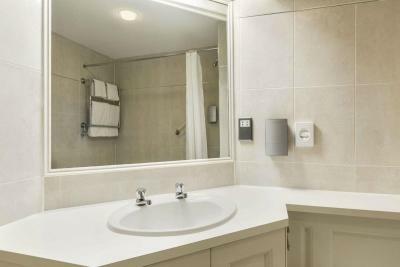 This en-suite room features 2 single beds accommodating up to 2 guests. 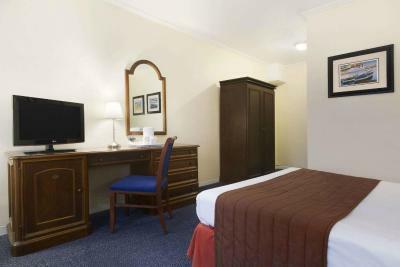 Facilities include a flat-screen TV with cable channels, desk, ironing facilities and a hairdryer. 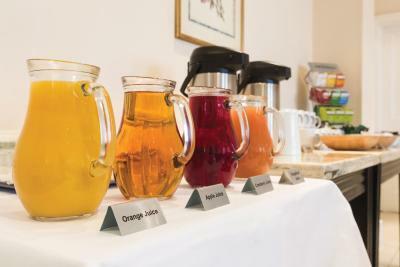 House rules Ramada Crawley-Gatwick takes special requests - add in the next step! Ramada Crawley-Gatwick accepts these cards and reserves the right to temporarily hold an amount prior to arrival. Breakfast - T.V.on in breakfast room, no choice if you wanted T.V. at 9.00 in the morning. Coffee weak and warm out of pump. Breakfast good choice, but not good quality, cheap sausage and bacon, and not very warm from self service heated trolly, waitress did not really want to be there was seldom in restaurant. Not really Gatwick 20 min drive away. Noisy outside at night, but not unexpected in a central town location. Poor toiletries and the shower didn’t work at all. Dodgy looking plug in extension socket for the kettle. Located quite close to city centre. The building we were staying in (I think it was called the Sussex Wing) was very dirty looking. The rooms were completely different to the building though which was nice. The actual building looked warn down and there was a car wash that started very early in the morning. I wouldn't of minded this but we had to keep the window open as the radiators wouldn't turn off.